SOURCE: Sent by, 'The Guardian Children's Books,' in exchange for an honest review. (and The World) is soon to discover the level of my social ineptitude. Anna Huntley is far from perfect: she is clumsy, crazy and a complete social outcast. At school, she manages to get by with her two new friends, Jess and Danny- until she sets the most popular girl at school; Josie's hair on fire. Her life turns upside down; as just as she is settling into her new home: her father gets engaged to Helena Montaine, a world famous actress. As Anna adjusts to her unexpected family, she finds herself in the spotlight. Suddenly she is attending world premieres with Helena's daughter, Marianne- and now everyone at school knows exactly who she is. Will Anna fit into her new, 'It Girl,' role? I have to say, this novel definitely made me laugh out loud at Anna's daily troubles- she was easily relatable, as a lot of teenagers struggle to fit in during their adolescence. I loved Anna's relationship with her dog- it is mentioned quite a lot in the book, as it is very humorous, because she is always frustrated with him, but still wants him as her number one furry companion. Also; Katy Birchall definitely captures the essence of teenage behaviour in the book, as they are often quite fickle, because the most popular girls in school want to be friends with Anna once she is known in the media. The plot was consise and sweet; the book being an absolute treat for me to read. It gradually lifted me out of my reading slump, reminding me of how much I adore reading as a whole. It rounds off with some brilliant morals, letting the readers know that actually, it doesn't matter if someone is 'popular'; they should, just have their individual assets that make them a really unique person to others. 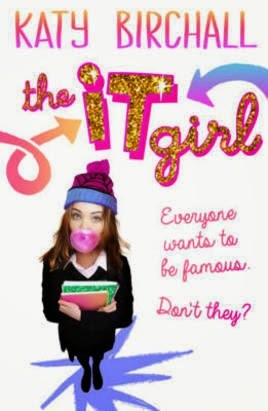 Overall, 'The It Girl,' was a enjoyable read, with elements in there that made me chuckle. I also liked the format of some of the book: as it was set it in emails and letters; which would be very appealing to the younger YA audience. Overall, I rate the book 3/5 hoots; as I thought it was lovely, and I would have definitely enjoyed it even more if I was slightly younger. I actually enjoyed this book quite a lot, it was a light-hearted read and was blooming hilarious, great review!